It’s always funny whenever The Oklahoman criticizes what its editorial board sees as the big bad liberal bias in the corporate media. It’s so funny that it becomes ridiculous. But the hysterical laughter gets followed by sad tears. An editorial in the newspaper on Friday made the standard GOP claim about liberal bias in the media and based its claims on how some of the Republican presidential candidates, such as Ben Carson, were getting treated badly by those pesky journalists who report their whacked-out statements and policy positions. What the editorial didn’t mention was how Fox News reports its “news” or the extremely conservative editorial positions of The Wall Street Journal or even its own aversion to the “bombast” of Donald Trump. What the editorial also didn’t mention was that The Oklahoman has long been considered one of the most conservative and biased metropolitan newspapers in the country. If anything, the newspaper has grown even more conservative under its relatively new ownership by Philip, Anschutz, the Colorado billionaire who made his riches in the drilling business. The specifics of the editorial matter little. I think it’s more important to report on how The Oklahoman has supported conservative local politicians, such as U.S. Sen. Jim Inhofe, who consistently embarrass the state, which gets nothing in return but bad press. Some might argue that, well, Inhofe’s bombast about how global warming is a liberal hoax is every bit as bombasty as one of Trump’s quotables, but that would be bringing logic to an illogical premise in the first place. Inhofe’s denial of scientific principles does indirectly benefit the oil and gas industry here, but the industry is going to frack where it wants to frack, earthquakes or not, Inhofe or no Inhofe. 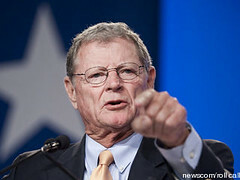 Seriously, Inhofe’s overall impact on the state’s national and worldwide reputation and image has been an extremely negative one and he hasn’t done anything extraordinary to help the Oklahoma economy, except to try to increase military funding (i.e., federal spending) here, which has probably often been done despite him not because of him. All this is a somewhat convoluted segue way into a reminder that the 2015 United Nations Climate Change Conference starts in Paris on Monday. We can hope countries will come together to reduce carbon emissions that increase the planet’s greenhouse effect and heats things up, which is resulting in rising sea levels putting coastal cities at risk and an increase in catastrophic weather events and patterns. We can only hope for progress. I don’t know if I’ll repeat what I’ve done several times before, which is to go over [to Paris] and be the bad guy, the one-man truth squad, and tell the truth, that they’re going to be lied to by the Obama administration. I don’t see much difference in the bombast here of Inhofe compared to the bombast of Trump. Note the similarities in the bragging and the bravado of the two men. What’s the difference between Inhofe calling himself a “one-man truth squad” and Trump saying, ““I think the only difference between me and the other candidates is that I’m more honest and my women are more beautiful.” Both men seem to see themselves as “right” and “honest, self-promoting hucksters who do it alone against all odds because, well, they’re more special and better than anyone else. This isn’t statesmanship. It’s unadulterated conceit. On a much sadder note, Inhofe’s weird positions on climate change could actually help to influence the outcome in Paris. Of course, Inhofe’s comments didn’t draw much media attention here, which is how the conservative and corporate media bias works. Listen. There’s no overall liberal bias in the corporate media. Sure, there are liberal journalists and writers, but how the news gets reported, whether in The Oklahoman or The New York Times is framed around white privilege, unfair market principles in the global economy, monopolistic policies, oligarchic worship and silencing voices that don’t fit into the corporate mantra and the status rhetorical quo of journalism. Sure, there’s still some great journalism that goes on in The Times and in other media outlets, and that’s important to free-speech, but let’s be real. The GOP has perpetrated the hoax of the liberal media bias for years now, and, as the “more honest” and “one-man truth squad” I’m going to say it because I’m the best. « Oh That Glorious Gobbler of Plenty!